You seem to have seen everything St. Petersburg has to offer: You have waited in line to get into the Hermitage, you have watched the drawing of the bridges across the Neva River and caught a performance of "Swan Lake" at the Mariinsky Theater. However, a St. Petersburg native would say that you still don’t understand the true spirit of Russia's northern capital. 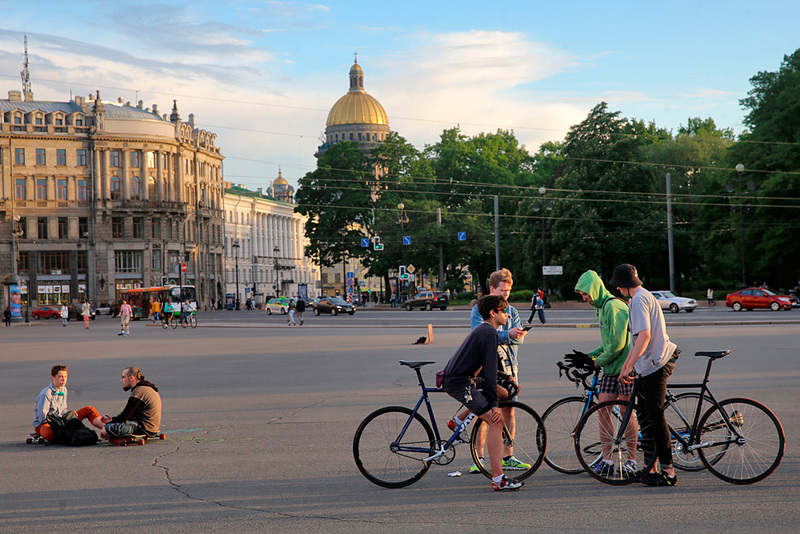 When Peter the Great founded St. Petersburg, he had been inspired by Amsterdam and Venice. Even today, water still covers about 10 percent of the city's surface. Make sure to enjoy a guided boat trip along its rivers and channels (regular tours in English depart from a pier at 27 Fontanka Embankment) or rent a private yacht for you and your friends. If you are into music, check out the jazz boat — a tradition that dates back to 1967, when St. Petersburg was still communist Leningrad. Perhaps the most interesting option is to explore the rivers and channels on a paddleboard. "We arranged our first SUP-rides a year ago, and this year we are planning to offer tours until the end of October," says Maria Stepanets, an instructor at Onego Surfing School. "The tour starts at 6 a.m., as we ride past the Savior on Spilled Blood Cathedral and the Kazan Cathedral, crossing Nevsky Prospekt. It is better than meditation: You have the sun, the smooth water surface with houses and bridges reflecting in it, silence and not a soul around." As you walk around the city center, make sure to take a peek into the yards: Their maze of inner buildings is a great chance to look at the life of common city residents. The city’s signature courtyards emerged as a result of the development boom in the latter half of the 19th and early 20th centuries. When landlords purchased the land plots, they demanded that architects create as much living space as they could, reducing public spaces to a minimum. Such yards are sometimes interconnected, forming passages that can reach hundreds of meters long. Therefore, if you enter the yard of Tolstoy House on busy Rubinshteina Street (house 15–17), you can exit onto the quiet Fontanka Embankment. St. Petersburg doesn’t have many viewing points offering a panorama of the entire city: Just 20 buildings exceed 100 meters and the first skyscraper (462 meters) will not be completed until 2018. The most compelling view is from the colonnade of Saint Isaac's Cathedral, which is open until 4.30 in the morning in summer. The Peter and Paul Fortress offers 15-minute helicopter rides for 5,000 rubles ($77) per person and 300 rubles ($5) will give you access to the roof of the rampart. You can also combine a view with a pleasant dinner. The Floor 41 restaurant, overlooking the south of the city from 145 meters up, the terrace of the Makaronniki restaurant that offers the best view of the Neva and the Solaris Lab coffee shop with a glass dome in the ceiling and mouthwatering desserts, are all great choices. This tip is especially relevant during the high season from May to September. Brace yourself and get up early to have a few moments alone with the city. Be the first to walk across Palace Bridge, which opens after the final drawing at 4:55 a.m. Cycle along the Neva's empty embankments and have breakfast on the beach of the Peter and Paul Fortress, which opens at 6 a.m. Oksana Kuzmenko, a manager of cultural projects and a longtime resident, believes that you can truly appreciate the beauty of Nevsky Prospekt only in the morning. "At 6 a.m. you will see it has a different side: It can be peaceful, relaxed, with few passers-by who do not seem to be rushing anywhere,” Kuzmenko says. “One of the most magical St. Petersburg moments is when the natural light breaks in and the street lights go off in the morning. This transition from night to day isn't easy to catch, but for me such moments are the essence of the city." Russian literature is probably a better guide around St. Petersburg than anything you could find in a tourist shop. In Fyodor Dostoyevsky's Crime and Punishment and in Alexander Pushkin's Bronze Horseman, the city is nothing less than a major supporting character, influencing the thoughts and destinies of other characters. “Seeing the Dostoyevsky Museum is absolutely a must,” says Doug Cardamone, an expat from the U.S. who has lived in St. Petersburg for 10 years. "Stepping inside is like going through a portal to the 19th century. I had always been interested in his literature, but I felt a special connection seeing his hat, his cigarettes, and some of his handwritten notes. Rarely can spending a half-hour be so enriching." The city was also home and a source of inspiration for Vladimir Nabokov, Anna Akhmatova, Joseph Brodsky and Sergei Dovlatov. A festival dedicated to Dovlatov, who emigrated to the U.S. in 1979 and died there in 1990, will be held in St. Petersburg for the first time from Sept. 2–4, in an event called D Day. Dovlatov grew up in Soviet Leningrad, but found fame only after he left.